For 54 days last summer, the “largest American aircraft carrier in the world,” as Ronald Reagan’s Secretary of State called the racist state of Israel, rained US-made weapons of mass destruction-white phosphorous, flèchette bombs, cluster bombs, dense inert metal explosives, fuel-air explosives-on more than one and a half million people, including children and women, trapped inside the world’s largest prison – the 26-mile long, 5-mile wide Gaza Strip. This monstrous war crime was the fourth such aggression against the people of Gaza by the Western-armed Israeli war machine since 2009. In 2006, Israel launched a similar war against the people of Lebanon and is now threatening to do so again. Since its creation, the racist state of Israel has waged unending war against the people of Palestine and such neighboring countries as Lebanon, Syria, Egypt, Jordan and Iraq. Today it also threatens to attack Iran. Today Gaza remains under siege, its people unable to leave or travel, to trade, to fish, to earn the basic necessities of life. Their only crime is to be indigenous people of the land of Palestine, a people that the racist apartheid state of Israel would like to eradicate. The continuing genocide against the people of Gaza, like the daily reign of murder and terror by Israeli occupation forces against the people of the West Bank, the daily acts of dispossession and discrimination against Palestinians living inside the racist state of Israel, and the suffering of millions of Palestinians living in exile, flow from one common cause: the nature of Israel as a racist apartheid settler state created by the destruction of hundreds of Palestinian villages and the expulsion of hundreds of thousands of Palestinians from their homes by terror, force and massacre. This crime was committed with the support of Western imperialist powers, especially the US and Britain, in order to create what amounts to a giant military base in the heart of the Arab world, at the crossroads of Asia and Africa. Be it resolved that the League stands in solidarity with the people of Palestine in their struggle to end 68 years of occupation and exile, and for the right of all Palestinians to return to their land and live in peace and freedom in every corner of the land of Palestine. We demand an immediate end to the blockade of the people of Gaza enforced by the US, Israel and the military regime in Egypt. We demand an end to the seemingly endless flow of arms and dollars from the US and other imperialist powers to the racist Israeli state that makes its crimes possible. We call on all members of ILPS to support the global struggle for boycott, divestment and sanctions on the racist Israeli state. We demand the freedom of thousands of Palestinians, including hundreds of children, imprisoned by the racist Israeli state. We demand the freedom of imprisoned Palestinian revolutionary leader Ahmad Sa’adat. We call for an end to the persecution of Palestine solidarity activists around the world. 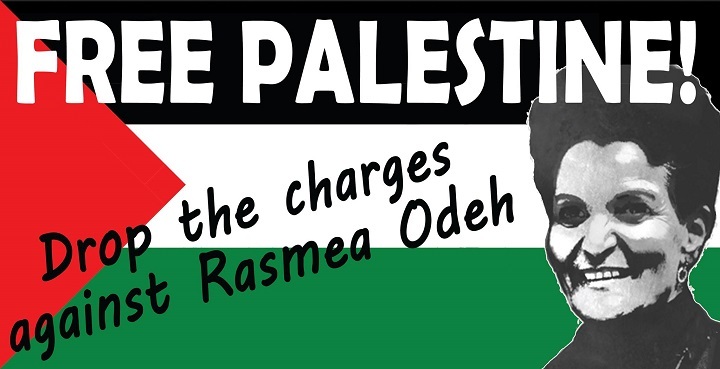 In particular we demand an end to the US government’s persecution of Chicago Palestinian community leader Rasmea Odeh, a 68-year-old grandmother who was falsely imprisoned and tortured by the Israeli state and is facing lengthy imprisonment followed by deportation by the US regime. The US federal government, which orchestrated her conviction, is planning to sentence her on March 12, 2015. We call on member organizations of the League to take part in solidarity actions on or send protest letters prior to that date.